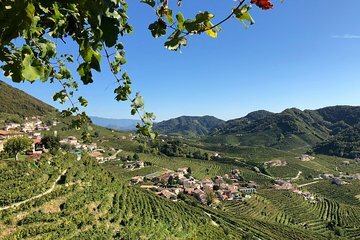 Viaje em veículo privado de Veneza para as pitorescas Prosecco Hills para um dia especial de degustação de vinhos. Você aprenderá tudo sobre a produção de vinho Prosecco e amostras de vinho espumante de alta qualidade em dois estabelecimentos. Durante este período, visite a osteria familiar do seu guia para um almoço típico de 4 pratos com receitas transmitidas pela “Nonna” e deliciosas sobremesas caseiras.Esta excursão de dia inteiro tem um limite de oito passageiros para garantir uma experiência íntima. We easily met up with Carlo in Venice and joined 2 other couples for a ride in a Mercedes van. We visited 2 beautiful procecco vineyards and tasted many excellent wines. Our lunch at the family restaurant was very good and huge. So many courses and choices of food and wine. Carlo was exceptionally informative and friendly. He dropped us at our tour boat at the end. I could not imagine a better day tour. Highly recommend Carlo and the tour. Carlo was great, he is the best guide we ever had. Wine tasting was unforgettable thanks to him, and the food in his family restaurant was the best food we ever had! The whole day was very emotional and the nature we saw was- you must see it! We are defiantly coming again to Venice next year and will book that same tour with Carlo! Prosecco Hills trip was amazing. Scenery and the education of the trip were great! Really enjoyed every experience this trip provided. Food delicious! Especially the tiramisu, this was the best tiramisu I’ve ever had. è stato fantastico! We had a wonderful tour with Carlo who was such a genuine, friendly and knowledgeable host. Our van was comfortable and accommodated the 7 of us well. We had a delicious croissant with apricot marmellatta and a bottle of water as we started our journey. We went to two Prosecco wineries and had tastings at both places with delicious snacks at the last one. We then had a sumptuous 4 course meal at the family restaurant. We even went up to a hillside church and had a birthday cake for two of our group. Carlo went over and above to make this a special day for all of us. The tour was very educational as well as enjoyable. It was well worth the price. Highly recommend.